We’ve been using compute-intensive machine learning in our products for the past 15 years. We use it so much that we even designed an entirely new class of custom machine learning accelerator, the Tensor Processing Unit. More than 70 authors contributed to this report. It really does take a village to design, verify, implement and deploy the hardware and software of a system like this. 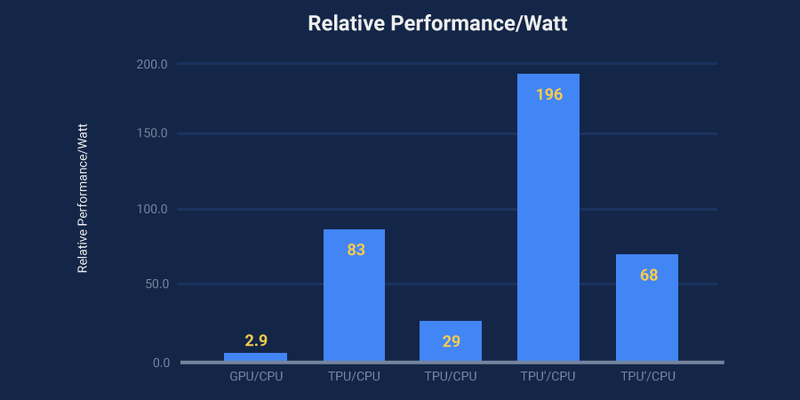 The need for TPUs really emerged about six years ago, when we started using computationally expensive deep learning models in more and more places throughout our products. The computational expense of using these models had us worried. If we considered a scenario where people use Google voice search for just three minutes a day and we ran deep neural nets for our speech recognition system on the processing units we were using, we would have had to double the number of Google data centers! TPUs allow us to make predictions very quickly, and enable products that respond in fractions of a second. TPUs are behind every search query; they power accurate vision models that underlie products like Google Image Search, Google Photos and the Google Cloud Vision API; they underpin the groundbreaking quality improvements that Google Translate rolled out last year; and they were instrumental in Google DeepMind’s victory over Lee Sedol, the first instance of a computer defeating a world champion in the ancient game of Go. We’re committed to building the best infrastructure and sharing those benefits with everyone. We look forward to sharing more updates in the coming weeks and months.